Earth Day: Planes or Volcano? This year is the 40th anniversary of Earth Day, and was celebrated with a bang, courtesy of Iceland’s Eyjafjallajokull volcano. 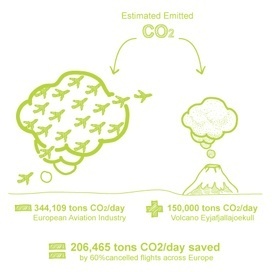 While Eyjafjallajokull’s been spewing out 150,000 tons of CO2 per day, the 11,000 European and international flights cancelled per day have prevented over 340,000 tons of CO2 from entering the atmosphere, collectively lowering our emissions by 206,000 tons each day. It appears that Eyjafjallajokull’s antics are actually doing the environment a bit of a favor.